It was a rainy day, but anticipated Bellas still went to another series of BDJ event titled Portrait Me Flawless. I'm feeling excited about this, to learn new things and meet people with same interest. Registration was opened when I came and I'm so glad the event held at One Corporate Center, because this is only few steps away from my office. Each table were setup with the materials needed for our sketching workshop. I can feel the excitement of other girls too. I totally like the color choices of this event. There are pink, black, white and purple all over the place. We had a little chit-chat and took some photos at photo opp while waiting for the program to start. One of the event organizer, her name is Jasmine, check each table and ask how are we feeling that day and if we are all excited, you know some casual conversation to make us feel more comfortable. She also opened the program and we started with a short game. 6 Bellas volunteered to play. 3 young ladies won a flawless product. 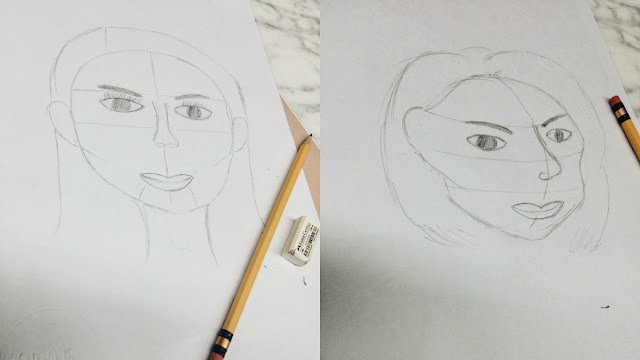 After that game, we welcomed CJ de Silva who taught us the Basic Face Portrait. CJ de Silva is a Filipino art director, painter, illustrator and graphic designer. She was known as a "Gifted Child" and a "Promil Kid." CJ said that Portrait is capturing the persona of the person or capturing the real person essence. I learned that sketching starts with basic shapes. I wish I can teach you here in my blog post but this kind of art must be taught in personal. I was so busy listening to our teacher and for a very long time, I felt like a student again. Please don't judge my work. I'm not really an artist. After learning the basic portrait, we had a break and energized ourselves again for the next activity. Thank you BDJ for our luscious meal. Upon finishing our meal, Dra. Kaye Bautista shared to us how to take care properly our skin. Skin is the largest organ of our body and acts as a waterproof insulating shield guards against extreme temperature, damaging sunlight and harmful factors. Acne is caused by 4 processes. (1) Increased oil/sebum production (2) Blockage of pores (3) Inflammation and (4) Bacterial proliferation. Other factors are, hormone (ex. PCOS), family history, stress, diet and cosmetic/shampoo. Shampoo can cause acne because of the oiliness it produce on your hair to make it soft absorbs by your skin on your hairline. - Complexion is balanced (not too oily or too dry) and you rarely have breakouts. - Skin usually can crack, peel or being itchy, irritated or inflamed. - It is shiny and thick. Prone to blackheads and whiteheads. - Your skin can be dry or normal in some areas and oily in others such as T-zone (nose, forehead and chin). - Products that contact their skin, cause stinging, burning, redness, or tightness. Cleanse - wash your face with luke warm water with minimum of 60 seconds. Exfoliate - only twice or once a week. Don't exfoliate everyday. Apply your skin care - you can use toner, serum, face mask etc. Apply sunscreen -when applying sunblock the average time is 20 minutes to expose your skin from the sun. When choosing a sunblock, don't base it on SPF value, choose the product that has “broad spectrum" or "full spectrum,” because it covers both UVA and UVB rays. Unlike SPF, it only refers to your protection time from UVB rays, with no specific expectation for your protection level from UVA rays. After a very informative talk from Dra. Bautista, we resumed with our basic portrait sketching and this time we will sketch using our own picture. For 45 minutes we have to capture a flatlay photo of our finish portrait to win a special prize. I really enjoyed this event. Aside from learning from the expert, I got to meet other Bellas, had fun with them and shared our passion. Thank you so much BDJ for always sending me invites on your event. I discovered the BDJ planner January of this year and in a span of 6 months, I already attended 3 events and received a lot of items and freebies. Thank you to Ms. CJ de Silva and Flawless for an afternoon session of beauty, wellness and learning. What a great workshop! I like the sketching part and ooh, the girl from the promil commercial is all grown up na, I didn't recognize her. Learned a lot, especially on the sunblock part. Guilty of basing it on SPF, and going out right after applying it. Thia sounds like a lovely event.I would love to learn how to draw portraits! Looked so fun! I'm also a bella but I haven't attended any of BdJ's events. It always have a conflict with my daughter's sched. Well, hopefully, I can already join in their future events. Thanks for sharing this! Wow, I've not been washing my face properly! haha. Thanks for the tip, guess what, I screenshot saved it, lol. Ayaw pa copy paste ng site mo e. hehe. That's definitely one fun and exciting event! And thank you for the tip about how to choose the correct sunscreen product. I'll keep that in mind! Ive never been to BDJ workshop, it should be cool to go with all these beautiful ladies. I don't know how to draw but this event looks fun and sounds exciting! I used to be a Bella as well but since most of the workshops are held in Manila, it was hard for me to cope with their events. I'm from Pampanga btw. So whenever they have events and I have some things to attend to in Manila, I go to their events so I can hit 2 birds with one stone. I hope I can attend in their future workshops again. Ohhhh. Wish I was there. I've always wanted to learn how to draw a face. Yours look beautiful tho. Great job! Looks like a fun event. Great to know how to properly take care and wash the face. I should probably take note of the shampoo to use. Hello fellow bella! Haha. Hope to attend future bdj events too, bought my first planner this year hehe. I love it! I love that you learned how to draw. I've always had a problem drawing faces. Would have loved to learn how! Also, now I know the order of how to properly take care of my skin! Thanks!